A Initially, a series of information evenings will be held to familiarise both the general public and local businesses with the project and how it will work. Q I dont have much Irish. Can I participate? A Yes! 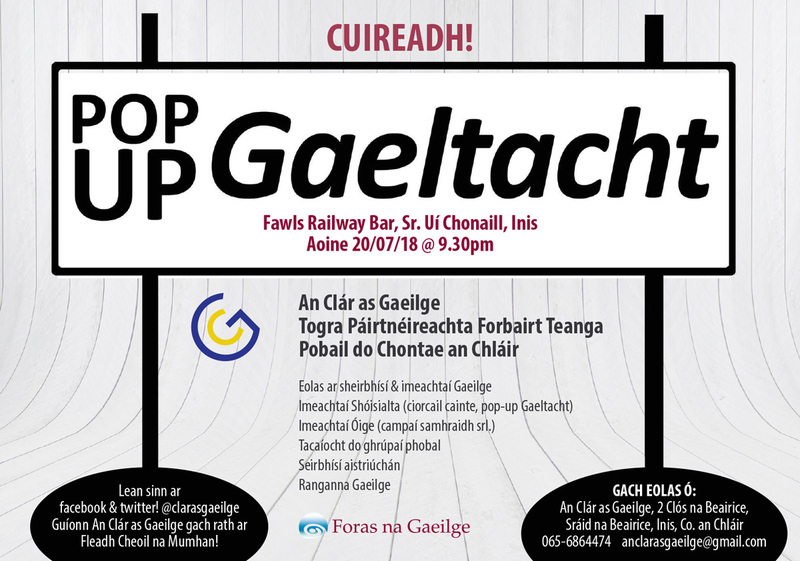 Support in the form of ‘Conversation Circles’ will be provided to cater for everybody, whether a beginner or a more fluent speaker ‘as Gaeilge’. Times of these Circles will be flexible to facilitate both the business community and the general public. Q What other support systems will be available? A comprehensive phrase book to help in doing business ‘as Gaeilge’. A range of stickers and internal signs ‘as Gaeilge’ for retailers. A professional translation service, available locally through an Clár as Gaeilge, to help with advertising copy, brochures and signage for local businesses. Advice and support on how best to market your business or product through the medium of Irish. 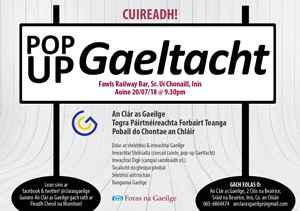 Identifying suitable Irish language advertising opportunities and helping local businesses to avail of these. Q ‘Inis Dom!’... what will the long term benefits be for the town of Ennis? A ‘Inis Dom!’ will help to consolidate the image of Ennis as a centre of Irish traditional culture. It will create a unique atmosphere in the town, making it an attractive shopping destination for visitors and locals alike. Being a bilingual town would make Ennis a natural choice as a venue to host major international cultural festivals.